On a glorious October day in 1898 a tense silence lay over Jerusalem. Like so often before, the city was to witness history being written. Protestants were celebrating Reformation Day, and Kaiser Wilhelm II made a special pilgrimage from Germany to inaugurate their magnificent new church – the Church of the Redeemer. Its slender tower overlooked the venerable Holy Sepulchre, the ancient centre of Christianity in Jerusalem. The two buildings are almost side by side. 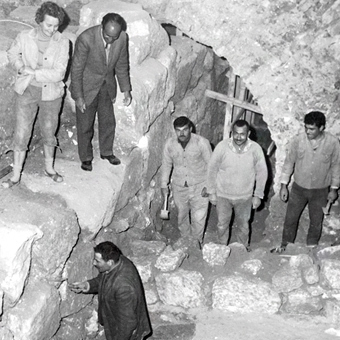 Both Protestants and Catholics had wanted to build as close as possible to the alleged site where Jesus had once been crucified, buried and where he rose again on Easter morning. The question of where exactly this happened had been a subject of hefty debate for Catholics and Protestants for decades. While Catholic Christians, in accordance with the traditions of their church, believed that Calvary, i.e. the place of Jesus’ execution, was located in the middle of the Church of the Holy Sepulchre in the Old Town, some Protestants doubted this. According to contemporary Roman and Jewish customs, they said, the crucifixion place and especially the burial place must have been outside the city walls. They had in mind a certain site to the north of the walls. To resolve the dispute, it was important to find out exactly where the city walls had been at the time of Jesus. A sensational discovery was made during excavations for the new church: Construction workers came across a wall that German scholars identified as the ancient city walls that had already been mentioned by the Jewish historian Flavius Josephus. With the help of the new science of archaeology, the dispute was settled. Protestants and Catholics were both winners: the place of the Holy Sepulchre was actually located outside the city walls in the lifetime of Jesus, and the grave seemed correctly located. The new church was consecrated in the pious belief that its foundation stone rested on the city wall from the time of Jesus.